Being a "thinker" in the 21st century is a down-trodden activity. With video games, the internet, smartphones and clickable life events, "What is there to contemplate, just go and live." But God prods us to use our brain. 17 Qur'an verses for reflection below. We humans have the intellectual faculties (`aql) to reason, believe in the invisible and learn. This is why we have been made from clay, the most malleable substance on which God prints our humanness. And the more we reflect on the signs of God, the more we love Him. 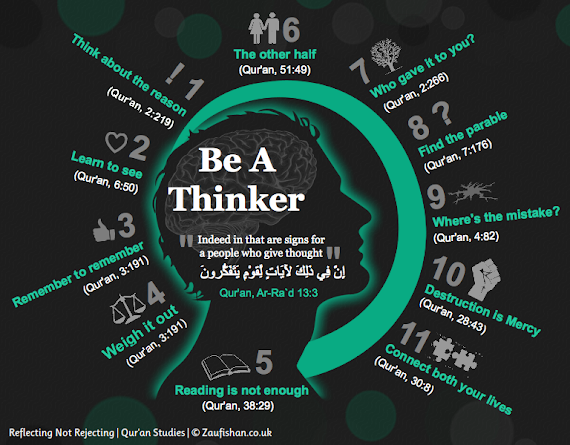 Some of the Qur'an ayaat asking us to think beyond our own noses are below. I've studied all of these verses partially to a level where I can discuss the tafsir, root verbs and any rulings derived from them, and I highly recommend you to do likewise. Above is my revision poster based on these verses. Some time soon insha-Allah I'll distribute this. Those below marked with an *asterix are not in the poster.